KIEV, Ukraine -- Ukraine held a military parade in central Kiev on Sunday to mark the 65th anniversary of the victory in the Great Patriotic War. 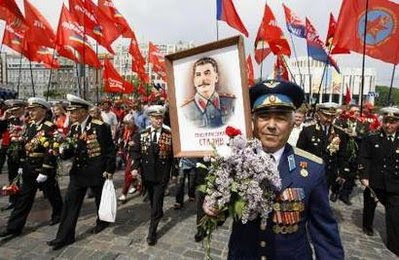 War veterans march through the centre of Kiev holding flags, flowers and a portrait of Soviet dictator Josef Stalin in the centre of Kiev, on Victory Day, May 9, 2010. Ukraine celebrated the victory over Nazi troops on Sunday. Ukrainian President Viktor Yanukovych, accompanied by many veterans of World War II as well as other guests from the country or abroad, watched the parade at the Independence Square. The parade started at 10:00 a.m. local time (0700 GMT). Military vehicles, trucks and cars dated back to the times of the Great Patriotic War, and soldiers in the uniform of the Soviet Army of 1941-1945, marched on Khreschatyk street as the military band was playing. The military parade was led by a legendary T-34 tank with the symbol of the Victory Flag on its turret. Infantry, tank-men, navy, partisans as well as women soldiers marched through in high spirits. A total of 2,664 troops of the Ukrainian armed forces, 75 Russian and 130 Belarusian troops joined the military parade, said Ukraine's Defense Ministry in a news release. Similar celebrations were held on Sunday in Odessa, in the Crimean port of Sevastopol, and other big cities across Ukraine. This was obviously not a popular event. In Australia we also have a day commemorating the fallen soldiers who served in the defence of freedom; our veterans and their sons march in honour in numbers of 80,00-100,000 in every state capital where the parades takes up to 5 hours to pass. This is a sign of a popular support for an honourable cause. Ukraine has a population of 50 million and when only 2,400 veterans are interested in showing their pride and support it indicates most people want to forget about the war. One can speculate whether the popular feeling is that there was not a lot of liberation or freedom or victory resulting from the lives lost in the "Victory" war.